I love when my toddlers come up with a new activity all on their own, that is entertaining, fun, and has some learning value too. This is one of those and it is a favorite! I love this activity because it is a simple, fun way to engage toddlers in object to picture matching skills, which are so important to their development. For a wonderful explanation of how beneficial these skills are read the Benefits of Object-Picture Matching by Twodaloo. We started with one of their favorite books: First 100 Words by Roger Priddy. This book has been a favorite for a long time, especially the last 2 pages which are all animals. My little guys are obsessed with animals right now! We keep our books and puzzles in the same area, and one day the boys pulled out their wooden puzzles at the same time as this book. 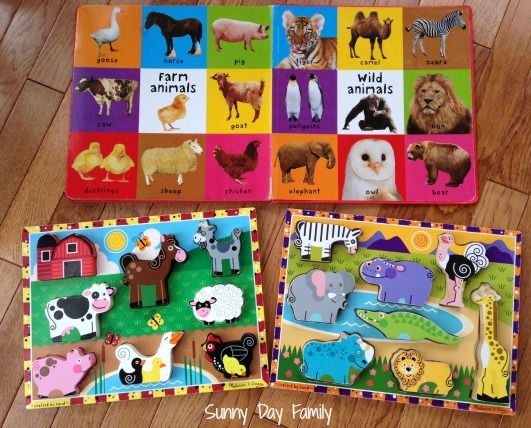 We found that 2 of their puzzles - Melissa & Doug's Wooden Safari Puzzle and Wooden Farm Puzzle had a lot of the same animals as in the book. They started laying the animals on top of their pictures... and a new game was born! The boys have so much fun with this - we often play when I'm looking for a quieter, wind down activity before dinner or bed. We get the puzzles out, open the book, and I'll ask questions like, "where's the pig?" and they match the puzzle piece to the book. For the pieces that don't have a match, I'll ask something like, "Is there an elephant on this page?" or "Is there a penguin on the puzzle?" 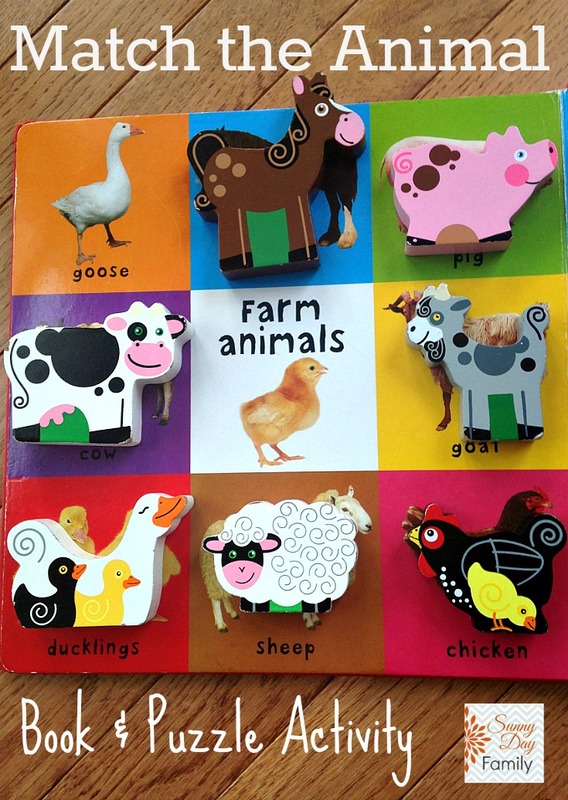 We also practice making all the animal sounds too. 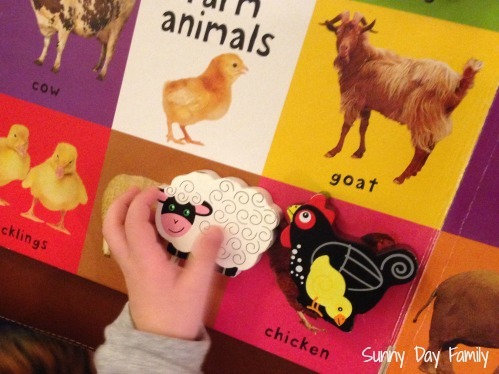 You can easily adapt this activity to any book with animal photos and other small animal toys. Or if your kids have other interests, there are wonderful pages in this book on vehicles and common household items too. So many possibilities!